In the shadow of the Andes Mountains, Mendoza’s wine regions and high altitude vineyards are pushed to develop bold, unique flavors in extreme conditions found nowhere else on earth: Incredibly clean air, intense sunlight, frosty cold nights and mineral-rich Andes snowmelt to provide water to the vines. Few winegrowing regions in the world boast the bold combination of elevation, climate, sun exposure and natural irrigation afforded to Argentinian viticulture and the vineyards of Alamos. Tucked under the massive shoulders of the Andes Mountains in west central Argentina, the province of Mendoza is renowned for housing some of the country’s best winegrowing regions. 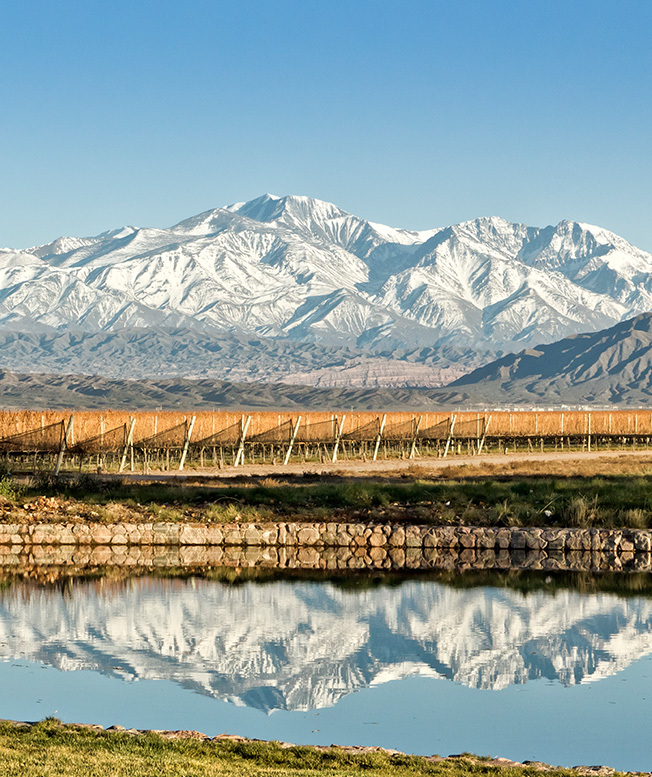 The character of Mendoza wines is forged in high altitude desert vineyards at 3,000 to 5,000 feet, irrigated by mineral-rich snowmelt from the Andes. High altitude means cool temperatures and clear air, and clear air means more sunlight for building flavor in the grapes, helping to make Mendoza the source of Argentina’s well-earned reputation for top quality, unique wines and viticulture.